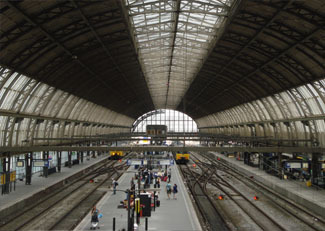 Since 1998, Dutch railway infrastructure manager ProRail has been working on the establishment of a high-speed railway connection that allows passengers to travel from the heart of Amsterdam to the centre of Paris in a little over three hours, passing through Rotterdam and Brussels. The Netherlands, on the whole, has an efficient railway system but this is the first connection of this country to the European network of high-speed trains. At its peak, the HSL-Zuid (as the train is called in Dutch) will move with speeds over 330 kilometers per hour. In order to ensure safety, the railways in most European countries use a harmonised system called ETCS. This is an application that runs on top of a GSM-Rail (GSM-R) wireless network infrastructure. For safety as well as for service, a flawlessly functioning GSM-R system is a necessity. As with any project of this magnitude, a number of firms are involved. The superstructure of the railway is built by a consortium named Infraspeed, consisting of constructor firm BAM (Netherlands) and the technology firms Siemens AG (Germany) and Fluor Daniel (United States). While ProRail is the owner of the GSM-R frequency license and thus the official operator of the GSM-R network in The Netherlands, another consortium was brought to life for the actual roll-out of the wireless infrastructure. This consortium is called Mobirail and it combines the expertise of KPN Telecom with that of Siemens. 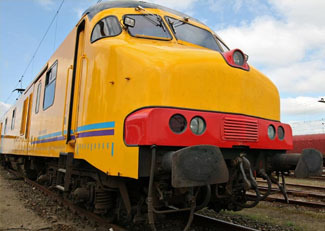 The Dutch government imposes strict requirements on virtually every element of the high-speed train connection. This is in order to ensure safety and railway efficiency. To make the communication infrastructure fully compliant, the Mobirail consortium hired a specialised firm to plan (design and rollout), verify and optimise the GSM-R network. This specialised company is Clear CinCom. The first step in the process of rolling out the GSM-R network is for the radio planners at Clear CinCom to translate the government imposed requirements to design criteria. One requirement was that travellers may only be minimally distracted by infrastructural objects outside of the train. Thus, the number of pylons used should be minimal. This implies that the distance between transmitter and receiver should be maximal. At the same time, safety requirements call for the network to have a high level of redundancy. Other requirements were put down to ensuring efficiency and a high level of customer satisfaction, guaranteed by high quality on-board information systems. Moreover, optimal voice communication should be available to both maintenance and railway personnel. Clear CinCom combined these (often contradictory) requirements into an initial cell plan or nominal network design. Secondly, the drive test team of Clear CinCom went out to establish continuous wave measurements. A special car equipped with a mobile test transmitter and receiver was used to determine the optimal placement of the pylons. 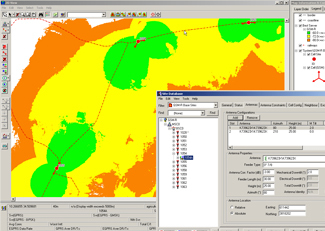 After this verification, the nominal cell plan was translated into the final cell plan. This plan consisted of recommendations concerning the placement and the height of the pylons, the azimuth of the antennas, the type of antennas to be used and their vertical inclination (tilt), the initial output of the transmitters and the number of carrier units they should contain. This latter specification determines how many simultaneous connections can be made. In this case, the requirement called for 120 guaranteed ETCS-connections for security and 80 voice connections for communications at any one time, distributed equally along the line. Considering the small frequency range that GSM-Rail is to work with (in this case the 921 to 925MHz frequency band), this is a relatively high quantity. Should we add the fact that this new network had to be integrated into the existing GSM-R network covering the normal speed lines, then and it becomes clear how this posed an interesting challenge to the Clear CinCom-team. Modern verification equipment combined with the expertise of Clear CinCom allowed for the final network plan to be fully compliant with all the requirements while using only three carrier units at each location. Once the network had been set up, Clear CinCom was asked to optimise the system. To this end, a special test train equipped with measuring tools was used in order to calculate optimal settings at low and high speeds. From this test train, the Quality of Service parameters were compared with the requirements put forth by the government. The Clear CinCom optimisation report contained suggested changes to the BSS-parameters of the Base Station Controllers (BSCs). Since the planning had been done carefully, almost no additional hardware adjustments were necessary. By the end of 2007, the GSM-R network proved compliancy with the specified requirements enabling ETCS trains to safely run at high speeds. The dimensioned speed of the train is 250km/h however the Clear CinCom design was successfully tested to a speed of 330km/h.